Do you buy groceries on Amazon at all? I do, but I am mostly interested in buying organic and unprocessed foods. You can get some really good deals if you buy in bulk but also some individual items tend to be on offer a lot. I am also finding that it’s cheaper to buy on Amazon than directly from the brand. I really like shopping on Amazon – you have everything in one place and you don’t have to go to several different online shops to order specific items and delivery is free (as long as you choose items marked ‘FREE Delivery on orders over £10’). This weekend I ordered quite few things on Amazon and here I just wanted to share with you the things I bought, many of them being organic health foods. You can read the review of Minvita’s baobab fruit powder in one of my previous posts but the summary is that I really liked how versatile baobab fruit powder was and I enjoyed using it in a variety of ways. You can use it in your smoothies, porridge, pancakes and even thicken sauces with it. It’s really nutritious and a great addition to your normal diet so I concluded that it’s something worth using regularly. This weekend I have finally made time to order it from Amazon ! I bought Sevenhills organic hemp seeds before, after reading some good reviews about them and I also saw some bloggers recommending it. 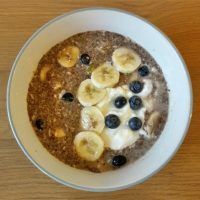 Hemp seeds are great for adding to your porridge, muesli and smoothies and they really help me feel fuller for longer. They are a complete protein, meaning that they contain the perfect balance of essential amino acids which are important for good health (the amount of protein per 100g is around 30%). They are also rich in omega 3 fatty acids which are necessary for human health – the body cannot make them and you have to get them through food. Not enough of omega 3 in your diet will result in dry skin, poor memory, mood swings and even heart problems! You will also find omega 3 in fatty fish, rapeseed oil, some nuts and avocados for example. Using hemp seeds in your meals is just a way of adding more omega 3 to your diet especially if you think you are not getting enough (maybe you don’t eat fish for example). Hemp seeds are also a great protein source for vegetarians and vegans. On Amazon you can choose to buy Sevenhills organic hemp seeds in packages of various sizes. I buy 1kg as I tend to use hemp seeds a lot but it also works out cheaper per 100g (£1.60 per 100g). This is one of my favourite products from Linwoods . It makes porridge delicious and nutritious with the mix being a good source of iron, zinc and omega 3. It’s also rich in antioxidants and fibre which really helps me feel full for long time. This is one of the products I tend to have in the fridge all the time and when I am running out I am always on the lookout for offers on this product. I once found it reduced in Sainsbury’s and bought a couple of packs from there. Sometimes you will find it on offer in Holland and Barrett. It doesn’t happen very often so when it does I tend to stock up! When there is no offers around I just buy it from Amazon like I did this weekend. Linwoods also have some other great products worth checking out, all of them great for smoothies or porridge. Have you tried any? I drink a lot of green tea, on a normal day at work I would have 4 cups but at the weekends I drink less, maybe 2 or 3 cups a day (less if I am out and about). I must be an addict! If you drink that much green tea it’s really important to drink organic. I searched online a lot in the past to find a brand who sell organic green tea which would not break the bank and I found Clippers. The best deal seems to be on Amazon , but you have to buy in bulk – I buy 6 packs of Clippers organic green tea for £9.99 and in each pack you will find 50 teabags. I like the fact that their teabags are unbleached and that the product is fairtrade. If you want different type of organic tea, you should be able to find it all on Amazon, just check their Tea Store . Have you tried any of these products before and where did you buy them from? Do you buy any health foods or teas on Amazon? It’s always worth checking different retailers to make sure you get the best deal. Amazon is so great for buying a whole heap of stuff. I haven’t used it for healthy living supplies recently, but the stuff you bought is great. Yes, Amazon is great for buying all kind of stuff, I also buy other things on Amazon not only healthy groceries. You should definitely check it out next time you are buying some health products online as you may find some deals on it. Hope you had a good weekend – I’ve bought a couple of things from Amazon in the past, including Seven Hills’ spirulina, maca and wheatgrass powders. They’re good quality and the cheapest price I’ve found too. I LOVE amazon!! …and these look like some great groceries to buy!! So healthy and nourishing!! 🙂 Great finds girl!! Thanks Cailee! Yes, Amazon is great for this kind of things, thanks for stopping by!